The early 1990s were a time of magic and joy. At least, it was if you were a little girl in those years. In quick succession, Princesses Ariel, Jasmine, Pocahontas, and Mulan brought a thrill to the senses in Disney’s canon of animated hits. But, if you polled girls in their late 20s and early 30s today, the clear Princess winner would have been Belle. There was something tragically real about Belle in “Beauty and the Beast.” She’s beautiful, like all the rest. But, she’s smart, resourceful and just the right amount of romantic. She sees attractiveness behind her man’s looks and seeks to free him from iron bars of hardship. Belle had a depth to her that Ariel (the most attractive Princess, save the flipper issue) couldn’t match. 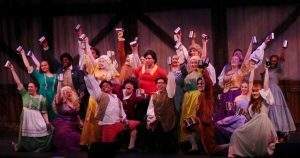 It is in honor of Belle and all that she means to Disney magic that Tacoma Musical Playhouse opened “Disney’s Beauty and the Beast” Friday night to a packed house. Cherisse Martinelli will understand comparisons of Belle and Ariel. Ms. Martinelli played Disney’s favorite mermaid just last summer and on this stage. She’s a veteran performer who knows how to emote youthful exuberance and innocence. Her singing voice, with range to the castle and back again, is suited beautifully to the role. Ms. Martinelli can play Disney Princesses until she’s old and gray…at which point magic will make her young again. Brandon Hell plays Belle’s Beast. Considering the fact that the Beast shares co-marquee billing he really doesn’t have much to do in the first act. It is in Act Two that Mr. Hell rents the air with his plaintive song and wistful desire to break free. It is a necessity that Disney Princesses have a tortured soul to play against. It is a further necessity that the tortured soul has anger management issues. Brandon Hell plays all facets of his role very well. He has the finest singing voice of the males in the company and is a treat to watch and hear. Jimmi Cook is a newcomer to the Tacoma Musical Playhouse stage, having plied his craft up north. He turned in a particularly memorable performance in Return of the Forbidden Planet for Centerstage in Federal Way. 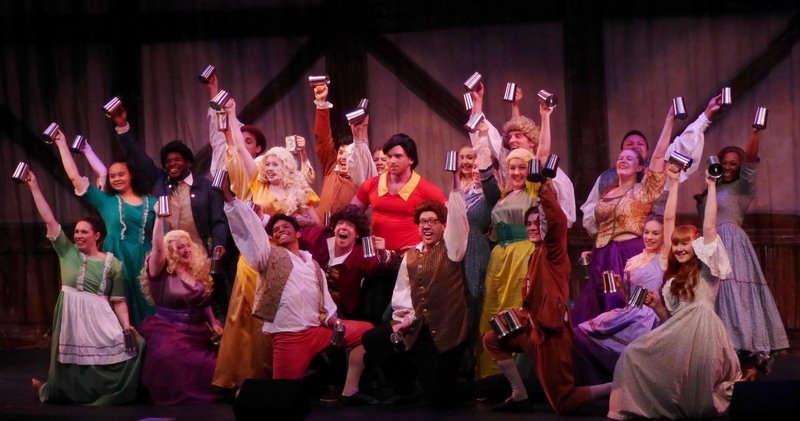 As the muscle-bound (and muscle-headed) Gaston, Mr. Cook is excellent! He has more than enough voice for the songs, and more than enough pectoral power to fill out a shirt. But, Mr. Cook is more than a pretty face. He is a fine performer and a valuable new member of the TMP family. What can be said about the comedy team of Mauro Bozzo as Lumiere and Chris Serface as Cogsworth? They aren’t really a comedy team but they could be given their standout team performance in this show. They share the stage beautifully and play off one another like the veteran performers they are. Mr. Bozzo has been boffo in everything he has been in for the last four years, having garnered an award nomination for Cabaret at Tacoma Little Theatre. In what can only be described as kismet, Mr. Serface happens to be the Managing Artistic Director at Tacoma Little Theatre. Excellent work, gentlemen. The audience found it a pleasure to be your guest. There was a time when Jake Atwood was one of the finest young performers in the South Sound. He isn’t anymore. That’s because he’s now one of the finest performers in the South Sound of any age! Mr. Atwood is at his best playing roles that climb a bit over-the-top. But, he has the ability to find the nuance inside the antics. In this show, he displays a side of Lefou that isn’t readily visible through the jumping around and absorbing punishment from Gaston. He does it with clever movement and a side-eye invitation to the audience to join in the fun with him. He is a treat to watch and a joy to watch grow into a career of which he can be very proud. Allyson Jacobs-Lake plays Babette in this show. Ms. Jacobs-Lake has been a hit in all of the Tacoma area’s major theaters and is a treat to watch and hear. In “Beauty and the Beast” Babette is kept busy keeping the wandering-eyed Lumiere in check. Silly girl. Only a fool would cheat on Babette. Another great job by this fine young performer. Whitney Houston once sang, “Children are our future…” and it is never truer than in the world of community theater. The kids on stage in this show will be the Cherisse Martinellis, Brandon Hells, Jimmi Cooks, and Mauro Bozzos of the mid-century. It is toward their future encouragement that we make sure to acknowledge their efforts today. Kennedy Arneson played the carpet in the Beast’s Castle and was a whirling dervish of movement and dance. She made her mother (Heather Arneson is in the ensemble in this show) very proud as she performed alongside. As for Howy Howard in the role of Chip we can only say that our eyes rarely left him when he was on stage. We watched him sing and noticed that he never missed a note. We watched him hit his cues with stage skill far beyond his years. Since children are our future, lovers of community theater can take heart with Miss Arneson and Mr. Howard waiting in the wings. The cast of “Beauty and the Beast” is 37 strong, and there are times they are all on-stage at once. That can be a nightmare for a sound designer and board operator. That many cordless mikes side-by-side. Oy! There were issues where the sound was concerned (mikes cutting out, or coming on-line late), but we believe they will get ironed out as the run continues. 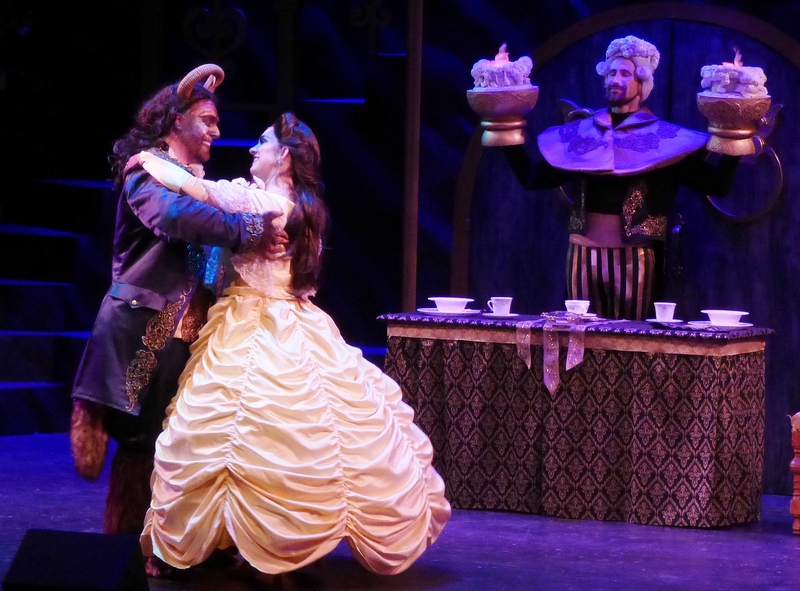 Costume designer Jocelyn Fowler is one of the South Sound theater jewels and she put together a beautifully costumed cast in “Beauty and the Beast.” Belle’s pink dress was a show-stopper, eliciting a gasp from the crowd. Ms. Fowler and her staff deserve a curtain call, but they won’t get one. Consider this their curtain call. Brandon Hell as the Beast and Cherrisse Martinelli as Belle perform magic under Lumiere’s illumination for Molly. Everyone is encouraged to see this show. If you know a Molly, have a niece or granddaughter Molly, you should buy a ticket soon. If Molly is your daughter, buy your tickets right now! The age of magic is fleeting!